With the colder temps, I’m starting to think about fall decorating, but I barely have my house put together let alone adding in fall decor, so I don’t think I’m going to make it happen this year. One space I do hope to at least make a little fall-ish is the front porch. This made me realize I never shared the completed street side of the house with you all. The sun peeked out for a little bit this morning after the rain, and I snapped a few shots so pardon the puddles. I love having these benches on the front porch. It’s the perfect spot to hang out with my coffee while my kids ride their bikes. All these pillows are just leftovers from the last house. I never quite found the right pillows for out here this summer, so the search continues. I also was late to the game to buy planters for the front, by the time I got around to it back to school supplies were in stores! Thankfully I borrowed these old ones from my mom’s garage and plopped some clearance hydrangeas in them. I’ll probably transplant them somewhere now that summer is over. The guys did such an amazing job building the pergola over the garage and I love the character it adds to this side of the house. You know I had to have flower boxes again (check out my flower box tips here) although having just 2 boxes versus the 7 I had at the last house has been less time consuming thankfully. I went with a mix of double impatiens, regular impatiens, and creeping jenny as the front of the house is mostly shady. They are starting to dwindle a bit with the cooler temps, but they were really pretty. I shared the lakeside of our home before, but I’ll share again in case you are new here. I’m really happy with how the dark siding turned out with the white trim, and I’m so glad we took the chance to go with a darker color. Beautiful. Love all the windows to let the natural light shine in but I sure wouldn’t like to be the person to clean them all. Looks so good with your colors you chose for your house. Love your window boxes. What will you place in them over the Fall and Winter? I’ll be doing a post on them soon for fall but I like to put cabbages and mums in them for fall and pine boughs in winter! Have followed your blog since well before the new house and loved watching it come to completion. It’s simply splendid, in all aspects! It would be nice to see a post focusing on landscaping before it gets cold (I’m a gardener and all I have seen so far is teasers). Also, I am looking forward to seeing views of awesome fall color from all your wonderful lakeside windows (the light in your home is wonderful). Blog on, gal! WOW, you home’s exterior has really come together! 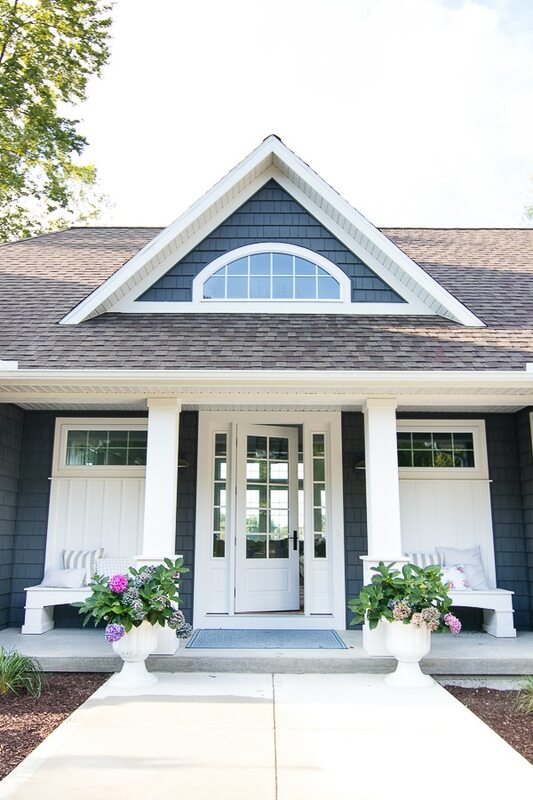 I especially love the trim around your front windows and the arbor over the garage doors. Nice! I’ve pinned several pictures of those features to save and hopefully incorporate into our next home. A job well done! Thanks Erika I really appreciate you sharing on pinterest! Such a beautiful home, ffront and back. Not one thing that I don’t love. Love all of this & your former house! I need you to build me a perfect lakehouse! It’s all perfection. Love love LOVE IT!!!!! Class all the way!!! I too am looking forward to some pics of the fall foliage around the lake!!! Blessings from Missouri!!! HI Robbin, I will be sure to include some when they turn, just a few red leaves around here so far! Is it possible to get info about these benches please? Did you build it or buy it? They are so charming. Love it. Hi Sanda, the trim guys build them for us. I’m hoping to decorate the porch for fall soon and share with you all but it’s going to be in the 80’s all week, not feeling like fall that’s for sure! Thank you for providing me such beautiful leverage in the “let’s move to the lake” discussions at our house. My husband wants to go. I want to stay. But…. I keep telling him if he finds me one of these I’m in! Oh so beautiful! I am so happy for you and your family that you get to have this dream house. Thanks so much Robyn we feel really blessed to live here. I am new to your blog & just love it. Your house is beautiful. I like the darker color with the white trim. It looks so much like the dream house I have in my head, lol! Thanks so much Cathy and welcome to the blog, thanks for reading! A true dream home! Thanks for sharing! This may be one of the most beautiful houses I’ve ever seen! Beautiful! I know you said you have cellular shades in the master bath. but do you plan on any other window treatments in your home? Street side? Or in the bedrooms, what sort of blinds or shades will you be using? Your house is gorgeous! I’m cracking up over your threat to perm your daughter’s bangs:) Are you liking the early cooler temps? I’m not ready for it yet in the Badger state but we don’t have a choice. I speak from experience as one who had my bangs permed a zillion times lol! Supposed to be in the 80’s this weekend here, Michigan is confused about the seasons as usual! Simply dreamy! Love everything about it. 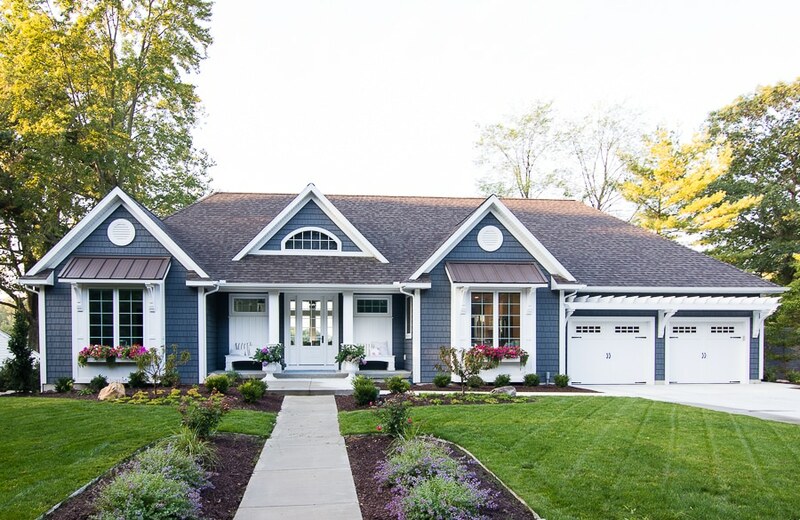 They have made huge improvements in this type of siding in the last 5 years it comes in all different textures and colors and it’s so practical and easy to take care of! Lake front or even ocean front, gorgeous home. The colors are beautiful, very welcoming:). Thanks Kathleen, we are really enjoying it that’s for sure! I love everything about your house. You have read taste and an eye for design. Thank you for sharing. I count the days to read each new blog post. Bravo, and applause applause! I grew up on a lake in the Seattle, WA area, and there’s just nothing better (unless a farm is attached). Looking at this splendid exterior, I wouldn’t change one thing! Thanks Lisa, I’ve always wanted to visit Seattle! You have done such an amazing job designing your home and in selecting all of the products and features – it came together beautifully!! Your home has been such an inspiration, and I just wanted to thank you so much for always listing the products you have used – it has been extremely helpful for me – Thankyou!!! Loovvveeee your home! But can’t figure out what lake you are on?! Love all the details and color choices. Oh I love the Street Side! So pretty! LOVE LOVE it all! Great job! Cant wait to see more pics. Love your beautiful house, and what you have done with it. Looking for houseplan ideas for a home in the mountains. How big is your house? Is there a way to purchase the floorplans? Hi Tonya, it’s about 3500 of finished sq footage but I’m not able to share the floorplans thanks! What kind of outdoor sconces do you guys have? 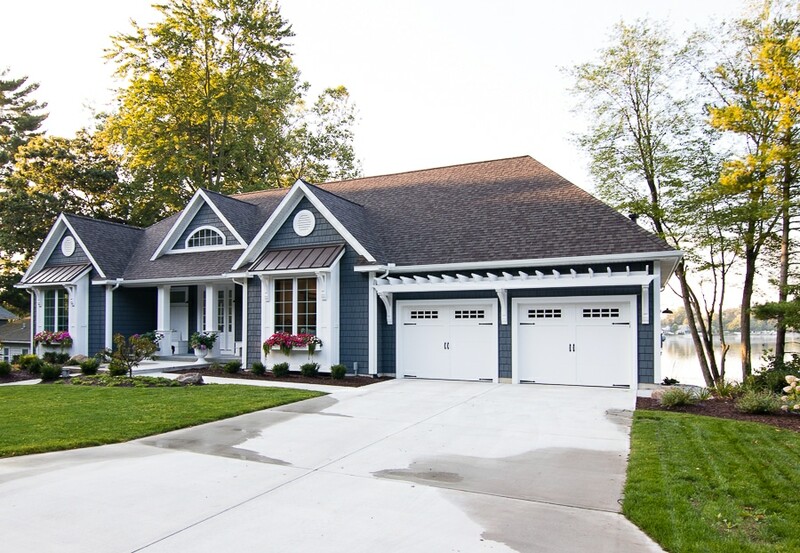 My wife and are building, and when given siding options, the one you have for your lake house was one of the ones we liked, and after seeing such a great detailed blog on it – not only have we become fans of that color, but your blog and style. Thanks! Hi Brandon thanks, we used an oil rubbed bronze sconce on the exterior. I think I just got them from Wayfair I’ll have to look it up! Your home is just beautiful!! I am also interested in learning about your shingle choice…brand and color! We are looking for the right shingle roof right now for our new build. We have very similar taste but will have white siding. Hi Michelle the color is Weathered Wood but I’m afraid I don’t know the brand name. Thanks! Chesapeake Bay home! So happy to see how beautiful it looks with white trim, just as I had planned. 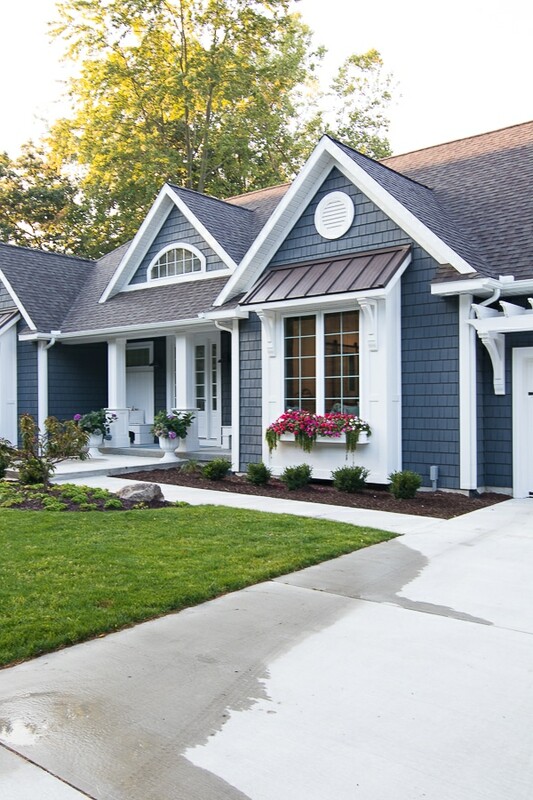 Would you be able to share the brand of the shingle and the color of the metal roofing? You mentioned before the color is weathered wood, but there are a few manufacturers that use that color name. We were going with a color more on the gray side but your roof color is much more becoming with that siding so hoping you can dig that up. Beautifully designed home! Hi Tammy, I looked back through all of my info and I cannot find the manufacturer of the shingles sorry! I just have a photo of it on my phone and the brand name is cropped off. The metal roof color is Burnished Slate and the company name just says Metal Sales on it. Sorry that’s not more helpful, good luck with your home! I love the corbels/brackets under your roof above your windows. I’m trying to find something this size, and I’m having a tough time. Do you know who made them? Did you have your trim people make them custom? Any info is appreciated. We live at the lake too and are redoing our house. Your home is beautiful. I don’t know who made them we ordered them out of a catalog but I’m not sure on the brand name. Try googling them a bit because there are lots of sites that sell them. I’m a little tardy to the party, but your home is gorgeous nonetheless! I love your siding color. Is it more gray than blue or vice versa? 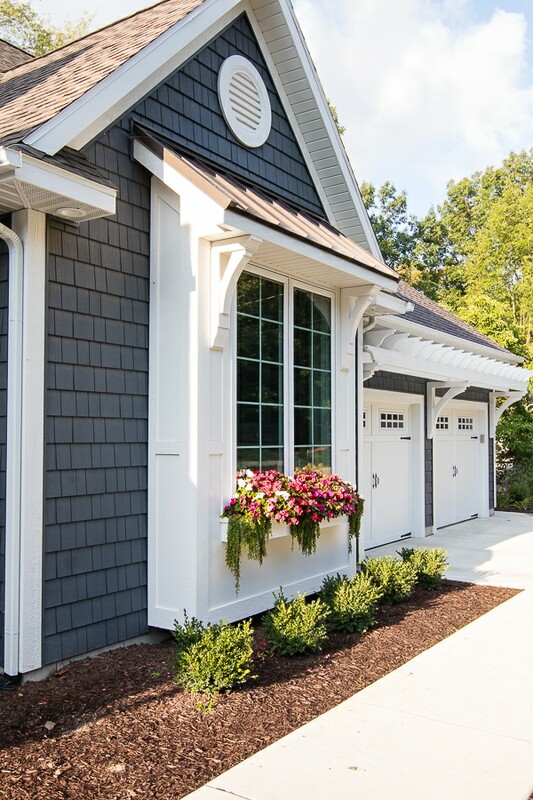 Could you share the brand of siding and color please? It really depends on the lighting! Sometimes it looks completely charcoal and sometimes it looks a bit blue. It’s vinyl shake by Mastic the color is Natural Slate. Love it! I’m building a home in NC and this siding is one we are thinking of doing! Our only fear is the fade since it is such a dark color…. how has yours held up? It’s been about 14 months and so far it hasn’t faded at all, we still love it – thanks! Hi, what is the trim color on the house? Thank you! Hi Stephanie, my painter color matched the soffits so I don’t have an actual color for you – sorry! Would also like to know the trim color? Beautiful home! HI Kristina, I don’t have a color for you because they just color matched the soffits – sorry! Do you have house plans (layout) for your home? I’d like to build very similar to this, this fall. It’s absokutely stunning and everything I’m looking for. Hi Jaren, due to an agreement with my architect I’m unable to share our floor plans. If you follow me on instagram I do a video tour that is saved in my highlights that gives you a better feel for the space – thanks!